It was Ralf's wedding celebrations at the Schumachers... and look what happened!! Schumi was proud of his first ever Best Man's speech at Little Ralfie's wedding. 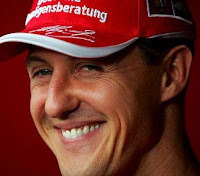 Ralf had warned Schumi beforehand not to mention Jordan and the 'funny' story, and Schumi said he could trust him on this one. But why, I said, WHY did he have to name him after one of my greatest rivals on the Formula 1 track? My nephew is now David Schumacher. I said I was not looking forward to Cora getting pregnant again. If she had twin boys I would no doubt be uncle to Kimi and Juan Schumacher! Everybody is falling about laughing.